WiperSoft and HitmanPro are security and threat removal tools developed for Windows PCs. So if you are looking for a simple yet effective malware detection and removal tool that also provides advanced real-time protection and protects your Windows PC against unwanted and malicious software, you have to read this article and choose your security tool for Windows! To start with WiperSoft, it offers quick and easy protection for Windows PCs. The security solution was developed by WiperSoft LLC in 2015, so the software is very young compared to similar security suites. WiperSoft offers PC users free and paid versions of the program. The free WiperSoft provides customers with privacy protection features, spyware detection, and free scan. The paid version, in addition to free features, also removes spyware, adware, and other computer infections, offers Free HelpDesk services that include free customer support and Free Custom Fix feature for specific threats removal with 6 months’ subscription. Downloading and installation of the application is simple and only takes a few seconds. The software is compatible with Windows XP and later. 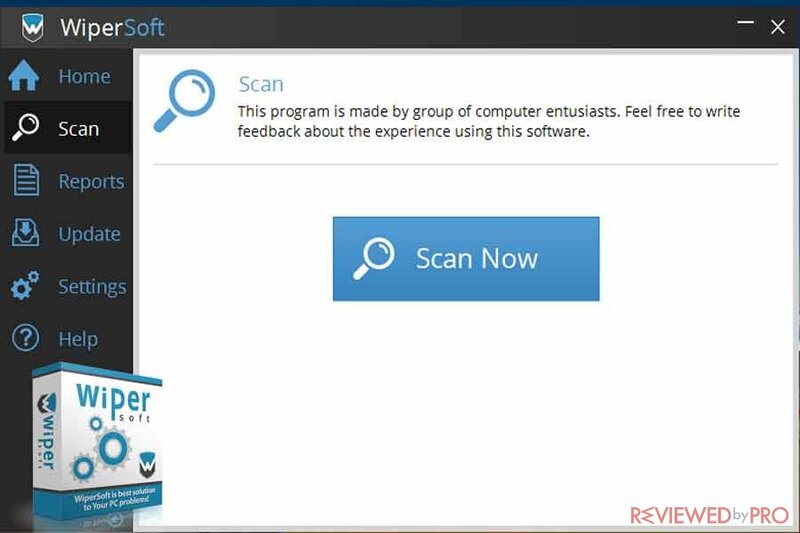 Once you install the software the automatic scan starts to perform. However, there is no possibility to disable this automatic scan. Researchers at Reviewed by Pro used the software for 30 days on Microsoft Windows 10 PC with 8 GB of RAM and HDD. The very first thing they have noticed it is that WiperSoft is fast and does not slow down the computer performance. In addition, they have revealed other pros and cons of this security tool. As it was mentioned before, the software works quickly – the full scan can be completed in about six to eight minutes. WiperSoft has no negative impact on the computer’s performance and does not drown the system. The software detects even the smallest infected files, which can be simply be removed by only one click Remove Threats. The full version of WiperSoft successfully detects and removes software. The program found all the malware samples that were installed on the test computer. WiperSoft is simple and effective malware that has an easy to use user-interface. WiperSoft successfully detected small threats. However, it did not manage to find all of the bigger infected files at the test computer. WiperSoft does not offer many features or scan modes, the full scan is the only available option provided for users. Many people are happy because WiperSoft’s scan can be completed in less than ten minutes and it does not slow the PC. However, scan results are not that impressive and WiperSoft can miss some of the bigger threats. After a full 30-day test researchers at Reviewed by Pro have provided readers with the final verdict. They have noticed that the program is very simple and fast, it can leave some threats undetected. Although WiperSoft is very simple and fast antispyware software, it left us with many disappointments because it is not effective against bigger threats and is quite expensive. WiperSoft antispyware would not be capable of protecting bigger businesses or heavy users of the Internet, but it could be great for casual everyday Internet users. 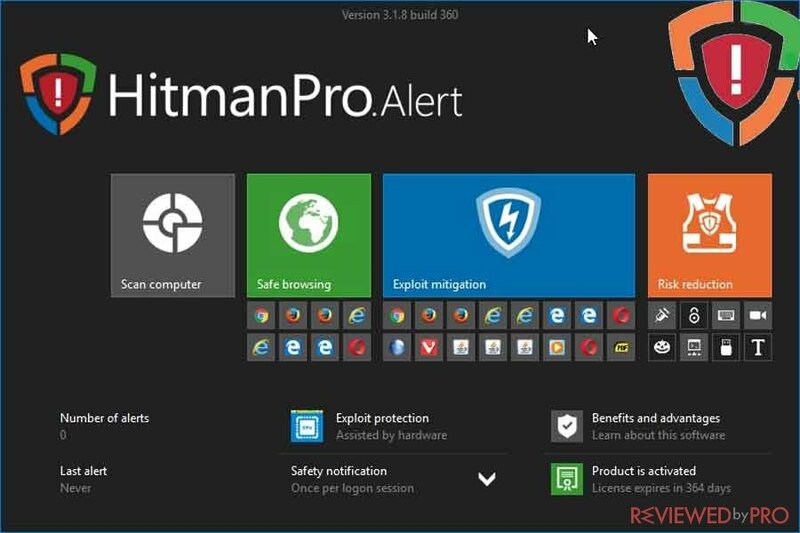 The second application we are going to talk about is HitmanPro removal tool. The tool was developed by SurfRight which belongs to Sophos family and was established in 1997. HitmanPro is a powerful application, however, it is also pretty simple and easy to use. In addition, the tool is very lightweight and also can be used directly from a desktop or even a portable external drive such as a USB flash drive. The installation is very simple and requires only a couple minutes. HitmanPro supports PC that runs Windows XP (only 32 bit), Vista, 7, 8.1 and 10. Researchers at Reviewed by Pro used the software for 30 days with Windows 10 PC. The computer had an Intel i5 processor, 8 GB of RAM and HDD. Researchers disclosed the main pros and cons of the software. The scan is pretty quick and only took about 12 minutes. The scan depends on the number of files you want to scan as well as your system speed. HitmanPro scanner detected more threats than an average antivirus tool. The application demonstrated a high virus detection rate because of cloud computing which allows HitmanPro to use a million servers to determine whether a file includes malicious content or it is safe and clean. HitmanPro offers a quick scan feature as well. HitmanPro also offers users the quarantine function which allows you to put detected malicious files and programs in a safe place before they are removed. Even though HitmanPro is a great malware removal tool it is relatively expensive because offers only basic features. HitmanPro’s user interface can be a little bit misleading because you have to first click on Settings, if you want to reach the main menu. 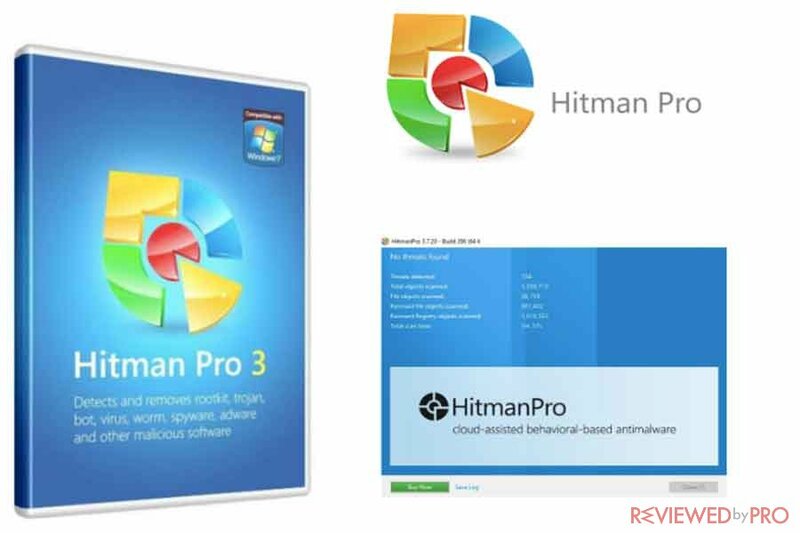 HitmanPro offers two versions of the software including HitmanPro and HitmanPro.Alert which offers more features. However, both of these versions are paid. Once researchers finished the 30-day test, they provided the Final Verdict. Hitman Pro is a very simple anti-malware tool. That is why it is great for users who just want to check for malware while other functions are unnecessary and not important. WiperSoft and HitmanPro are both effective malware removal tools. WiperSoft is a very young program compared to HitmanPro, which offers users more experience in the market. HitmanPro also offers better malware detection rates due to its cloud computing. So, the program is great for those users who require only basic features. It is very useful that HitmanPro provides users with a possibility to detect and remove threats from USB flash drive or any other external portable device. 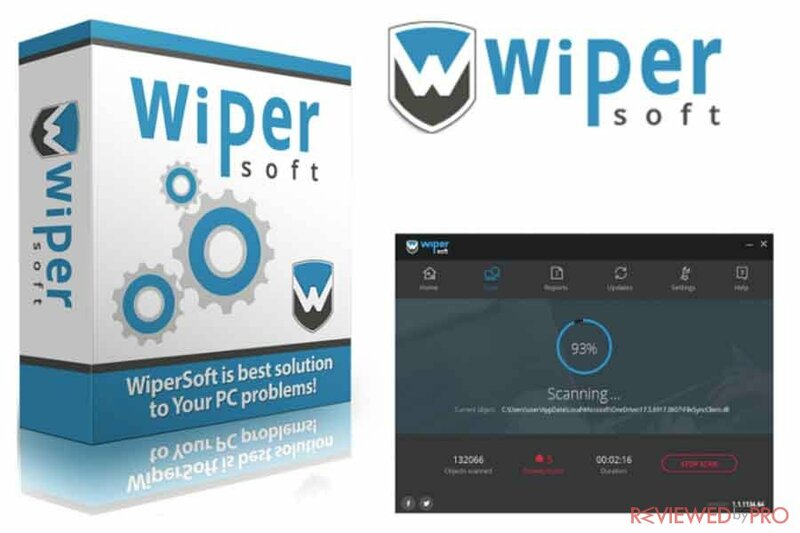 Meanwhile, WiperSoft offers fast scans that will be completed within less than ten minutes and will successfully remove all the threats detected on the PC. WiperSoft also offers a free version of the software which is good for those who do not want to pay for computer antivirus tool. However, researchers noted that is not effective with bigger computer threats and infected files, and wouldn’t be able to effectively protect businesses or heavy users of the Internet. ^ Alice Woods . WiperSoft Review. Reviewed by Pro . ^ Ugnius Kiguolis . HitmanPro Review. Reviewed by Pro. This entry was posted on 2018-01-25 at 10:01 and is filed under News.